Coasters are made using worsted weight 100% cotton yarn and finished size is about 5" across. Click on the "download now" link below the top picture to get the pattern pdf. Thanks for the pattern! I was just thinking that I should find something small to work on since it is starting to get warm out. I don't feel like having a heavy afghan on my lap to crochet right now! How beautifull you made that.. This week I'm going to try them out. Been having probleme posting lately. Hope you are good! Thank you for the cute daisy coaster pattern. I love Annettes idea to make a cute bunting/garland from them..good thing I got cotton on sale today. LOL Thank you. I've found you my pretty and now I must make lots of you and call you my own. Giggle giggle. Must have daisies!!! Love the pattern, thanks ever so much for sharing! Visiting from Sew Many Ways. Thank you for the pattern. I've printed it out and will pass it on to my DD who I am sure will whip them up for me in no time at all! :-) It's great to have a DD that loves to crochet! Adorable. Perfect for anyone's patio set -- especially MINE! These are really adorable! I wish I was better at following crochet directions so that I could make them and have them not be wonky! These coasters are great little things! Thank you for sharing the pattern! Those are so cute! 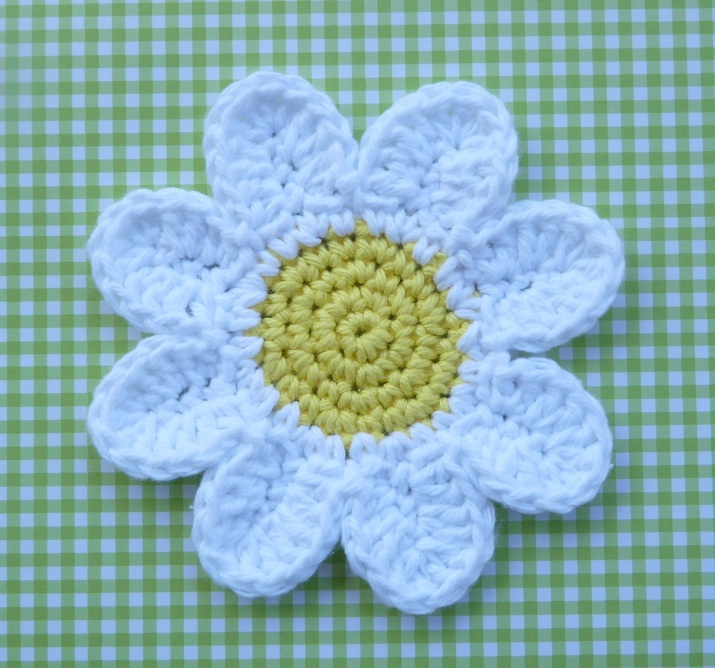 I love daisies so they caught my eye right off and now I guess I'm going to have to make some of my own. :) Thanks so much for the pattern! Thanks for sharing this pattern! You always come up with cleaver, easy, and cute seasonal patterns! Looking forward to trying this one out in the near future!! Ha! I saw these on pinterest and thought "that looks like something Doni would make". Little did I know! Very, Very Cute!!! What a lovely pattern, thanks for sharing! These are adorable!! Thank you. 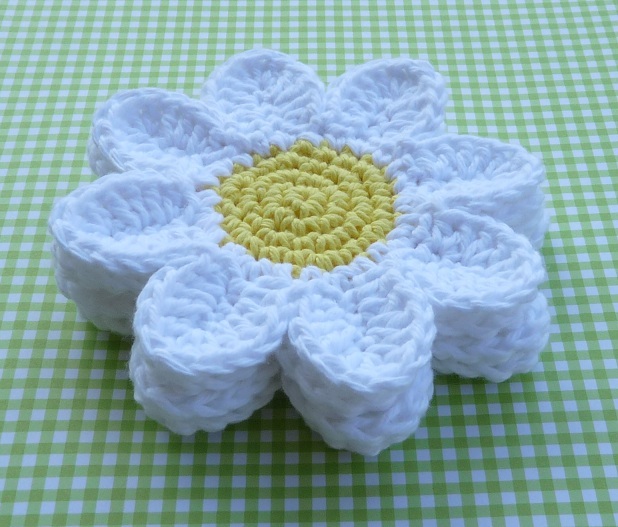 I've made eight of these little honeys, and they're the perfect Crocheted coasters. Thank you! Could you please e-mail me the pattern? I could not get the download to open. Thanks! These are adorable!! 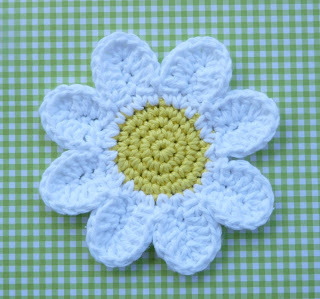 Perfect for a friend who's daughters name is Daisy! :) Thanks so much!! I tried to download it but for some reason my computer says "this kind of file can damage your computer..." Is there anyway that you can email me the file? planescrapper@aol.com? I would so appreciate it...I love love love this pattern! Hello Doni. I came to thank you for sharing your pattern and invite you to visit my blog where I posted my work and mentioned yours too. I appreciate finding this pattern for daisy coasters. I hope to make some for my sisters in memory of our mom whose favorite flower was the daisy.